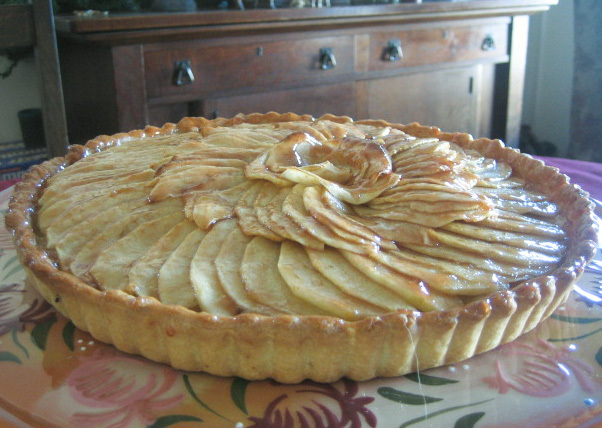 Make this French apple tart and feel like a pastry chef! Perhaps, I’ll get him up early and needle him about eating breakfast, making his lunch, and point out that even though he did all the dishes last night, he forgot to wipe out the sink and finish the job. I’ll follow up with a good threat about not getting his allowance. Wow, that just sounds grouchy and mean when I put it on paper. I can’t believe I even think that, let alone say it outloud. I could yell at him to make his bed, but he’s probably already finished that task. I almost got him last night. We both got home from school at the same time to find that the dogs had knocked over the garbage for the second time this week. That used to be Truman, our Labrador’s specialty, but our new German Shepherd, Maggie, has taken it to a new and awe-inspiring level of “doggishness.” Truman knocks it over and rummages for a mid-morning snack, and Maggie distributes every piece of garbage evenly throughout the house, including my bed. Yesterday’s trash included about four cups of wet mustard seeds that had accidentally been thrown away after experimenting with making homemade Dijon, and there was a trail of tears that covered the entire kitchen and back patio. Andrew started to balk at having to rinse the trash bin out with a hose and I saw my opening. But before I could get even a little reprimand out of my mouth he stopped me to say he just wanted to put on a sweatshirt because it was cold outside. I decided to go out for some fresh air and buy some more dog food. Picking a fight just keeps getting harder and harder these days. As I drove I contemplated my options for drama. Music practice? He made first chair. Lazy teenager? He’s training for the LA Marathon and started his first job tutoring a kid in math last Saturday. I guess now I’m just bragging. Sorry. It’s just that I’m worried. The truth is that a good fight with a touching resolution is a sure-fire formula for a successful blog entry and it’s been too long since I last posted. Typical, isn’t it? Fighting with Andrew is almost always more about me than him. I think I’ll just enjoy the gift of the fabulous 15’s for now. Sweet 16 is starting to peak its head over the horizon, and I know teenage driving in Los Angeles is sure to add some dramatic tension to our currently peaceful lives. Wait… I have an idea. I’ll make him one of his favorite desserts and then scold him for eating too much, too fast. That’s surely a way to get his goat and give me something to write about. 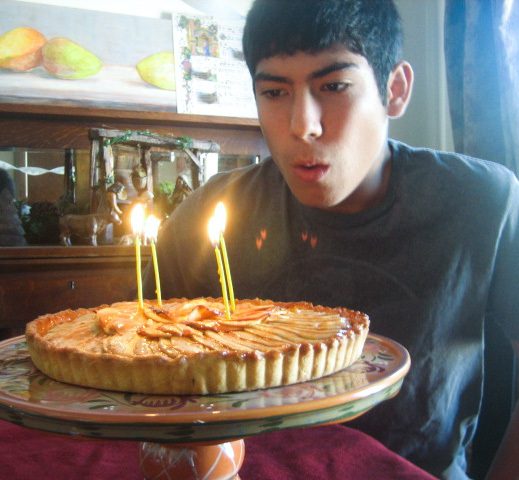 Andrew used to ask for an ice cream cake for his birthdays, but the last few years it’s been an apple tart that he prefers. It’s also a great dessert for the end of a heavy meal or a mid-afternoon snack. This was one of the first “fancy” desserts I learned to make over twenty years ago and even though the end result will make you feel like a pastry chef, it’s really not hard at all. This dough is easy to make and easy to work with. 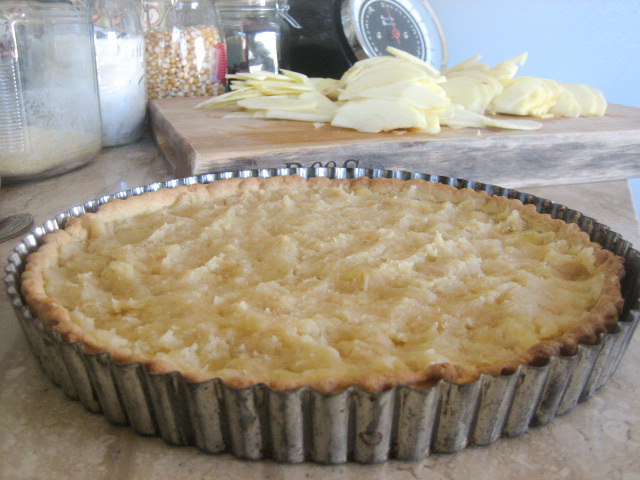 It is not a highly flakey American style crust, but it stands up well to the weight of the tart ingredients. I am giving directions to make it on the counter by hand, but it can be easily made in the food processor using the dough hook attachment. 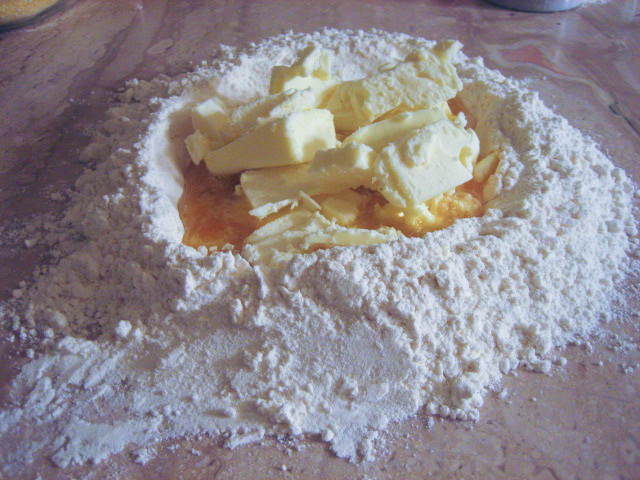 The kitchen should not be too hot and you should work the dough as little as possible to avoid a hard crust. 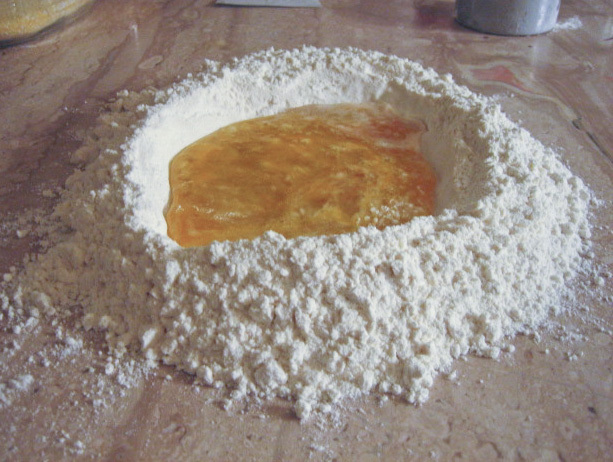 Place the flour in a mound on your work surface and make a well in the middle. Add everything except the butter and lightly mix it together with your fingers or fork. Add the butter and using your fingers or pastry scraper work the butter into the wet mixture. Nobody said it was low calorie! 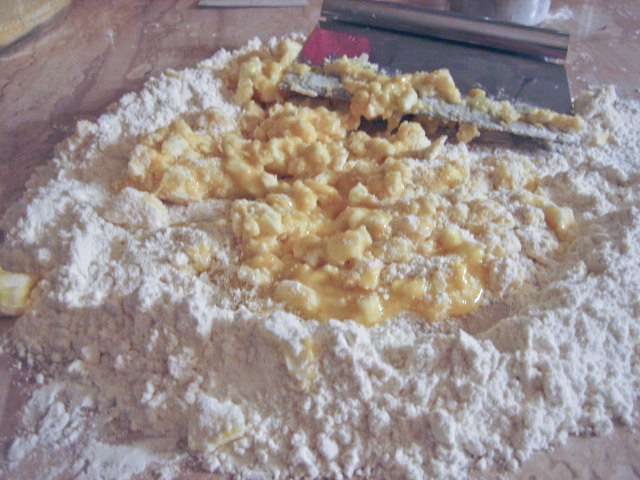 Next, using a pastry scraper, slowly chop in the flour a little at a time until the dough is mostly incorporated. Don’t worry if it’s not smooth at this point. Using the palm of your hand, push the dough away from you and massage it quickly and lightly into a smooth ball of dough. Wrap the dough in plastic wrap and refrigerate it for at least 30 minutes. This last step is crucial. The dough needs time to relax before it is baked. This will help prevent it from shrinking too much away from the pan. You can make the dough 2 to 3 days ahead of time. 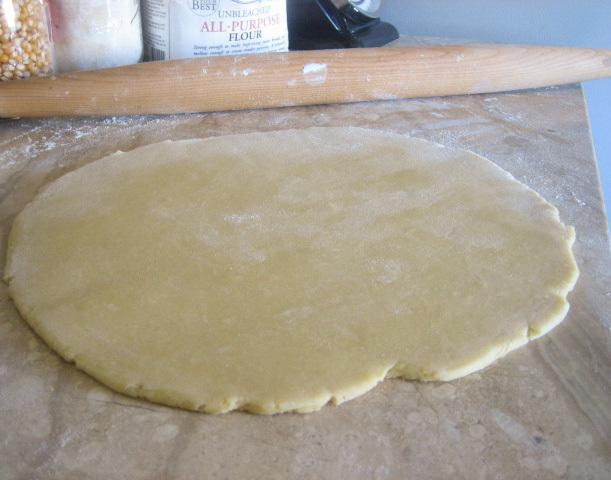 When ready to use, roll out the dough on a cool surface to about ¼ inch thickness and into a 12-inch in round. Carefully fold the dough in half and place on a lightly greased tart shell. 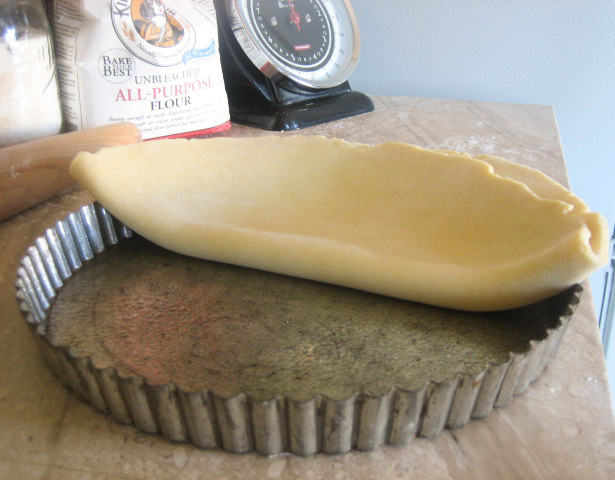 Gently unfold the dough to fill the pan and lightly press the sides around the pan. Fold the excess dough over the edges and roll your rolling pin over the pan to remove the excess dough. 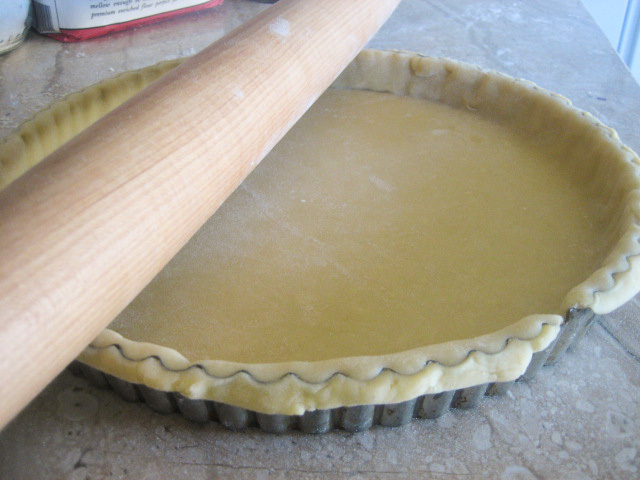 Now, using your fingers, press the sides of the tart up over the edge of the pan and “hook” it to the sides. 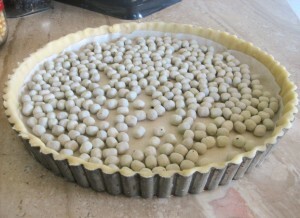 Place the tart shell back in the refrigerator and preheat the oven to 400 degrees. 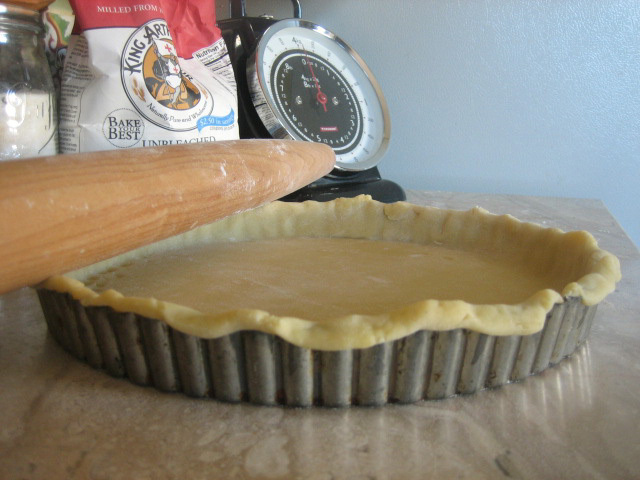 When hot, take the tart shell out and cover bottom with a 9-inch round of parchment or aluminum foil. 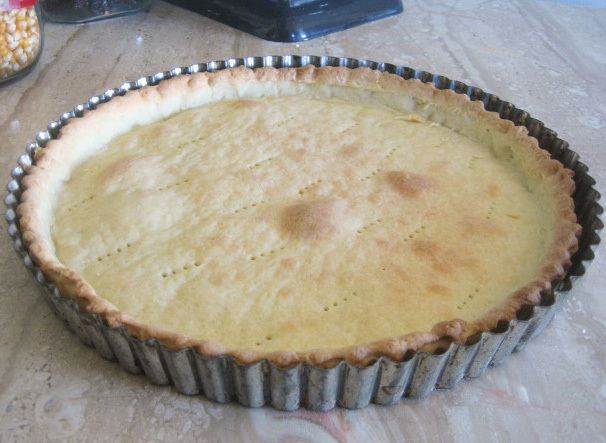 Prick the bottom of the tart with a fork or pointed knife. Place weights in pan and bake for 15 minutes. Remove the tart shell from the oven and take out the weights. Brush the interior of the tart with the beaten egg glaze. Turn down the oven to 375 and bake for an additional 10 minutes. Remove the shell from the oven and let cool. This filling works well for Pop Tarts and dessert dumplings as well. 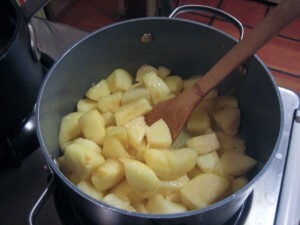 Melt the butter in a saucepan large enough to comfortably hold the apples. When the butter has melted, add the apples and slowly cook on medium heat, shaking the pan occasionally until the apples are soft. Once the apples are soft and starting to fall apart, add the sugar and vanilla and use a potato masher to get them to the consistency that you want. I like the applesauce smooth, but leaving little pieces of apple in the sauce works well too. Cook until you have a sauce that isn’t too wet. Set aside and cool. This can be made a day or two ahead. Bring both ingredients together in a small saucepan and cook until melted. If using apricot jam, strain the mixture through a sieve to eliminate the solids. This can be made ahead of time, but must be reheated before using. 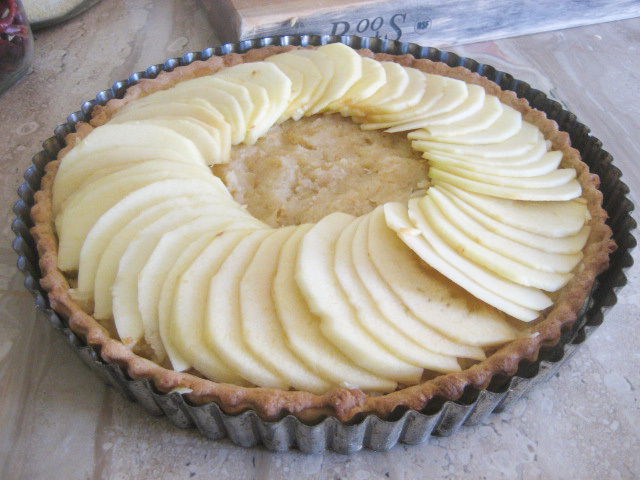 Fill the tart shell with the applesauce. Cut the apples in half and using a very sharp knife or mandolin, cut the apples into thin slices. You will need a few very thin slices if you want to finish the tart off with an apple “rose” in the middle. 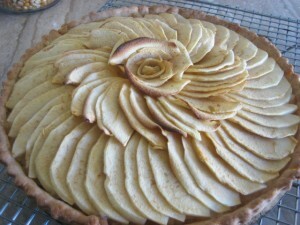 Starting from the outside and working in, layer the apples in an overlapping circle. You will have one outer circle and a second interior circle. 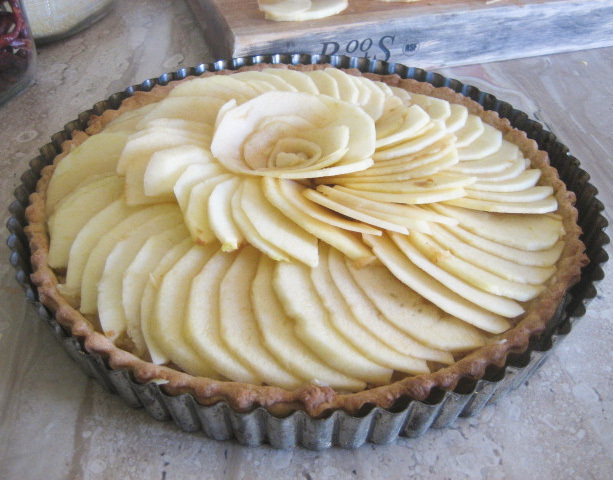 To create the “rose” you will start from the outside and work your way in with small, thin pieces of apple until you have two or three layers. 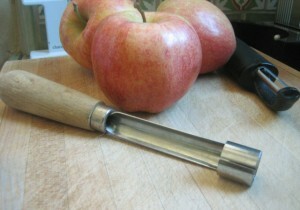 This is easier than it sounds; it takes a little patience to get the apple slices thin enough to be pliable. On the middle rack, bake the tart for 20 to 25 minutes or until apples are cooked and starting to lightly brown. If the edges of the tart start to get too brown, cover them with foil. All that’s left is to glaze the tart. Reheat the glaze and if needed, thin it with a bit of water. 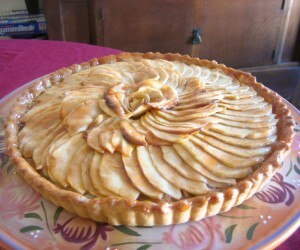 Using a pastry brush, “paint” the glaze over the entire tart. The tart can be served warm or at room temperature. Don, you are absolutely amazing!!! Your writing is delicious enough but how do you come up with such remarkable recipies?….and beautifully executed. More than well done! Previous post: Happy Birthday. Now shoot me!